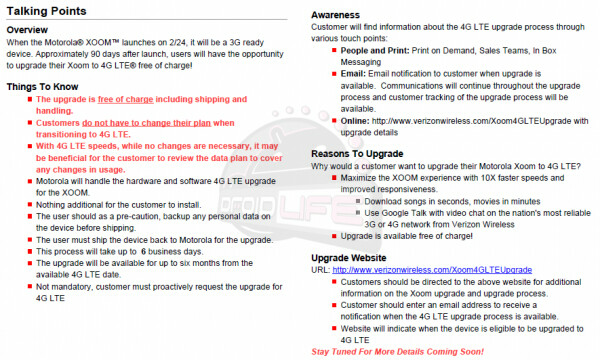 Leaked internal information reveals that upgrading the Motorola XOOM from 3G to LTE is not a simple matter of walking into your local Verizon store and waiting for the upgrade. Instead, owners of the Honeycomb flavored tablet will have to send the device to a Motorola factory approximately 90 days after today's launch of the Motorola XOOM. The process of updating the tablet will take 6 business days. Other information in the leaked material shows that shipping and handling will be entirely free and the upgrade will be available for a 6 month period from the time that LTE becomes available on the tablet. 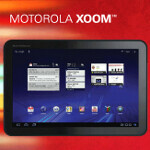 Verizon reps are being told to sell the 4G experience for the Motorola XOOM by telling customers that 4G will increase the speed of the device by 10 times while songs will be downloaded in seconds and movies in minutes. Verizon is telling customers to head to www.verizonwireless.com/Xoom4GLTEUpgrade and enter their email address so that they can be notified when the 4G upgrade will be available for their tablet. "Verizon reps are being told to sell the 4G experience for the Motorola XOOM by telling customers that 4G will increase the speed of the device by 10 times while songs will be downloaded in seconds and movies in minutes." Until you hit the monthly 95-percentile network usage threshold, at which time you get throttled down to EVDO speeds (~600 kbps).... One article I read recently, mentioned that the 95-percentile level is around the 5 GB level. I wonder how many HD movies being downloaded it will take to trip the 95-percentile throttling? During the months that I had the unlimited employee plan on my broadband card, I never hit any threshold and was never throttled. Is this something new with 4G? Your employer may have had a separate agreement with VZW for their plan. There was an article on phonearena.com about 2 weeks ago that discussed VZW's throttling policy. Maybe VZWEMPLOYEE will elaborate on the policy. Doesn't even seem worth it anymore. Way to kill the enthusiasm Motorola! If it wont do anything you expect, you might as well get an ipad and not have to worry about when 4g or flash will be available. You know up front it won't ever have them lol. good fail Verizon and Motorola. Good fail. I thought the 4G ugprade was an addon for the device that you more or less just connect to the device. Now you have to send to the manufacturer for the chipset to be put into the pad? Also gotta love even though the upgrade is free, people who do not have LTE services have to pay the same for the tablet as those that day. Whatever it takes to maximize profits I guess instead of selling it for cheaper for 3G then charge for the 4G upgrade. Then if they charged for the 4G upgrade you would be talking about how they are trying to maximize profits that way. No one ever said you have to connect the device to upgrade, you just assumed.